After a quick review of the back-tested trades on the basic version of the Short-Term Bollinger Reversion Strategy, I had an idea for a small tweak. Lo and behold, this improved results drastically! See, in the first set of system rules I shared, I was looking for RSI to be above 75 for short positions and below 25 for long positions. This didn’t seem to be catching the big moves or at least the ones that make it to the opposite Bollinger Band, so I figured I’d look for a bit more momentum instead. Short: If the signal candle high is greater than or equal to the top Bollinger Band AND the signal candle close is less than the top Bollinger band AND RSI just crossed below 75 but is still above 50, short at the open of the next candle. Long: If the signal candle low is less than or equal to the bottom Bollinger Band AND the signal candle close is above the bottom Bollinger Band AND RSI just crossed above 25 but is still below 50, go long at the open of the next candle. 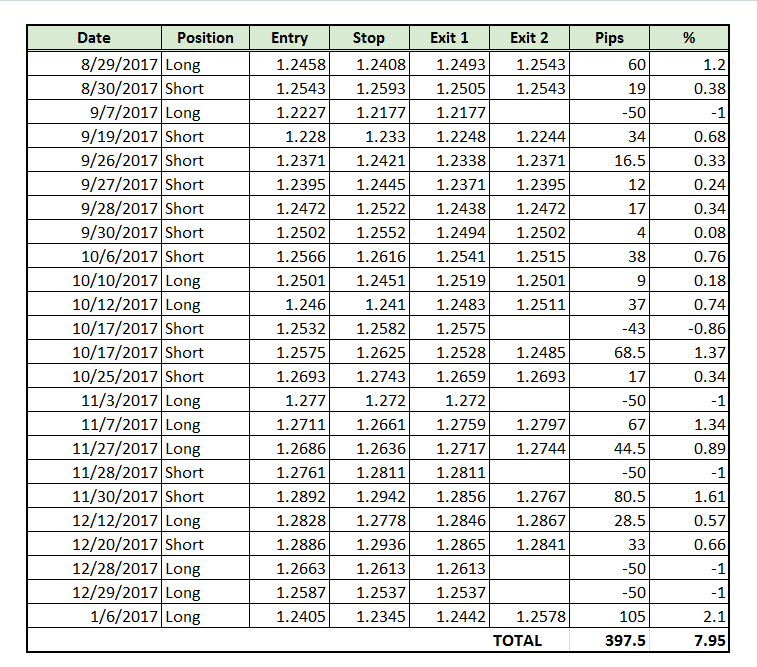 The strategy caught more trades during the period, not to mention ended up with an even more impressive 397.5-pip win or a 7.95% gain on the account. Of course this was also mostly due to the first trade opened for January this year, which yielded 105 pips or 2.1% in gains. Still, this is much better than the basic version that yielded less than 2% for the August-December 2017 period. The summary of metrics shows that this version also had a better win rate of 75% versus the earlier 66.67%. However, its average win is still less than the average loss. The maximum drawdown was the same at 2% which came from the sharp selloff that occurred in late December. Its maximum winning streak was also lower at 3.35% compared to the original version’s 3.88% gain. So which version is better? The bottom line P/L and win rate suggest that the tweaked version is outperforming the earlier one, but I’m still having some doubts because of the average win vs. loss and the maximum winning streak. Some of y’all have suggested looking at the ADX to filter out those signals that occur in trending markets (This is a mean reversion system, after all!) and I think that’s a good idea. Got any other suggestions?